My month of rum continues today, with a couple of drinks featuring Cruzan Black Strap Rum. One of my goals for this project is to explore the depth and breadth of rum; there are very many different styles of rum out there, and yeah, that’s one reason I find the category a little intimidating, but frankly it’s also why it excites me. The idea of tasting my way across the category is pretty cool. One thing I didn’t really explain last time was that I used Mount Gay Eclipse rum for the Royal Bermuda cocktail. That recipe calls specifically for a Barbados rum, as I mentioned, and I went with the Eclipse because, well, in part because it’s inexpensive, a good bargain at the 22 bucks my local pharmacy charges. (I think they’re overcharging a tad, but they’re so convenient that it’s worth an extra buck or three.) Also, in a rum-101 post, Matt “Rumdood” Robold recommends it as a good starter rum, in the amber/gold category. I’ve been using it for a couple of weeks now in various things and I find it to be a great mixing rum. It even sips fine, neat or on the rocks, although it’s a little simple for sipping; you’d probably want to go upmarket in the Mount Gay brand for that, and try the Mount Gay Extra Old, which is just delicious. Back to the black, now. The Black Strap is an interesting beast. You may have seen black-strap molasses around at the grocery and you may have even used it in, say, baked beans, but let’s step back and look at molasses for a moment. To make molasses, sugar producers take sugar cane, extract the juice from it, and then boil the juice so the sugar crystallizes. The molasses this first boiling produces is very sweet because sugar still remains in it. So to economize and wring out as much sugar as they can, producers then boil the sugar out again, and then finally a third time. It’s this third boiling that produces blackstrap. Interestingly, blackstrap molasses is one sweetener that’s actually good for you. The boiling process concentrates all the nutrients in the molasses, so blackstrap is rich in vitamins and minerals, especially iron. Blackstrap has an important benefit for distillers. Because it ferments quickly, it doesn’t form as many fusel alcohols as other ferments do. Without delving too deeply into distillation-101, let me just say that a certain amount of fusel alcohols are necessary for certain spirits, but if you have too many, the flavor is rough. So they must largely be removed from a distillate before it can be bottled. (It’s the presence of these that in part explains the “rotgut” reputation of plastic-bottle spirits and mason-jar moonshine.) 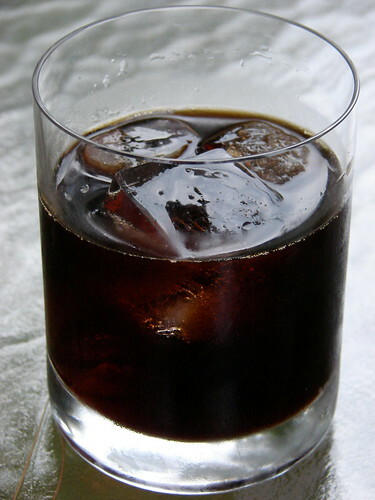 Blackstrap, because it lacks some of these fusels from the start, creates a smooth and easily drinkable rum. Which also means it mixes well into cocktails, and isn’t that why you’re here? So let’s get on with it. Hm. Equal parts rum and falernum? That falernum stuff is sweet. Very sweet. And what makes this a fizz is that it’s topped off with fizzy ginger ale. Not to second-guess Messrs. Curtis and Myers, I knew this had to be a simple typo, or the drink would be unbalanced and overly sweet. I told Jen I thought the 1 had gotten lopped off somehow and it should be 1-1/2 oz. rum. So I hit Google and sure enough, the results of the 2005 Rum Fest were posted, and I was right. There, Myers’s recipe calls for an ounce and a half. Fill with ice. Add 1 ½ oz. Cruzan Black Strap Rum and top with ginger ale. Stir. Be sure to muddle gently, though. 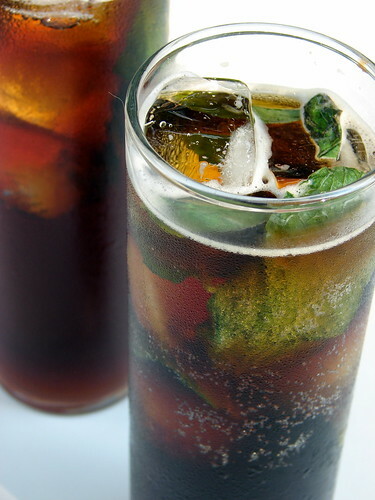 Press too hard on the mint, and you’ll open veins in the leaves that will express bitter oils into your drink. Build over ice in an old-fashioned glass. Stir. Cocktail photographs by Jennifer Hess. I have said this before: rum sits squarely in my blind spot when it comes to mixing cocktails. I find the category a little overwhelming, I must say. Rums span the globe; you can get good rums from just about every continent except Antarctica. Rums made from sugarcane juice or molasses. Rums aged for many years or very few. Rums from Barbados, Cuba, Panama, Guatemala, Martinique, Mauritius, Mexico. Light rums, amber/gold rums, dark rums, spiced rums, flavored rums, overproof rums. It’s … intimidating. But dayam is it good! I quite enjoy a great martini, a balanced Sidecar, a lovely rye old-fashioned, a good peaty single-malt alone in a glass. But a good sipping rum? I could come around to the notion that there’s the pinnacle of drinking. And rum, used wisely in a cocktail, marries well with a range of flavors. So it’s finally time to man up, look rum straight in the face, and stop flinching. From now until mid or late September, I’ll be exploring a month’s worth of rum cocktails–a drink a week that I think really exemplifies what rum brings to a cocktail. And to force myself into unfamiliar territory, there won’t be a daiquiri, Cuba Libre, or Dark and Stormy in the lot. And I am finally going to begin my exploration of the El Presidente, which Matt “Rumdood” Robold recommended months ago, when I was hoping to start exploring rum cocktails. First up, the Royal Bermuda Yacht Club Cocktail. I brought this one up as an idea for rum-running, before I decided on the El Presidente. I think I first encountered this drink when Doug Winship covered it during his Tiki Month, earlier this year. Even though I gave a lot of thought to running through it for the blog, I still managed to forget about it entirely, until I came across it again in Vintage Spirits. Doc Cocktail doesn’t have much information about it, but it’s apparently an early creation of Trader Vic Bergeron, a pre-Tiki tropical classic. The Royal Bermuda Yacht Club still exists, by the way, but I don’t see any cocktails listed on any of its menus, so I don’t know whether they still serve this drink. The recipe, curiously, calls for Barbados rum rather than a Bermudan variety. I’m not sure I understand that. The other interesting ingredient is Falernum. I didn’t have the resources to purchase the ingredients to make my own, so I relied on the dusty bottle of John Taylor’s Velvet variety.